Inspiring Stewardship helps leaders drive sustainable development and growth by balancing short- and long-term objectives amidst competing interests. By examining a range of exceptional individual and organisational stewards alongside insights from quantitative studies, this book unlocks the contributions you can make to enhance your influence and secure your legacy. Profiles of leaders from Ratan Tata to Bill Gates illustrate what stewardship really means, and the attributes and characteristics of steward leaders. Are they fundamentally different? Where do they get their exceptional drive and resilience? Why do they shoulder such huge responsibility? Risks, rewards, motivations and actions are explored in depth to give you a real-world view of stewardship, and to show you how to embody these principles in your own everyday life. The notion of stewardship has never been more relevant to business than it is today, as managers struggle to balance present and future interests. This book provides clarity, direction and guidance for more purpose-driven action. Today, ownership of firms is increasingly fragmented, investment structures are more and more complex and the time horizons of investors, executives and owners do not always coincide. Inspiring Stewardship helps you break through the tension and drive sustainable growth through adaptability and good leadership. DIDIER COSSIN is professor at IMD, Switzerland and the director of the IMD Global Board Center. He advises chairmen and boards of some of the largest corporate, financial and not-for-profit organizations around the world. Before joining IMD, he worked for Goldman Sachs, taught at Harvard University and was professor at HEC, University of Lausanne. ONG BOON HWEE is the CEO of the Stewardship Asia Centre, a thought leadership centre that focuses on promoting stewardship and the governance of companies and organizations across Asia. Prior to his role in the Stewardship Asia Centre, Boon Hwee gained extensive working experience in the civil service as well as the commercial sectors. 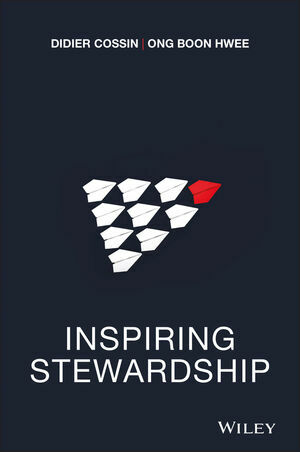 PART II What Drives Stewardship?